Thanks to Phil Clapham and James Mead for publishing their excellent summary of the biology of Humpback Whales (Mammalian Species No. 604, American Society of Mammalogists, Clapham and Mead, 1999). The below content is largely based on this scientific source. Any errors in the below material are my own. Large pectoral fins (the origin of the genus name, Megaptera: large wing). Humpback pectoral fins are proportionately the longest of any whale relative to body size (~one-third of body length!). Tubercles are also present on humpback whale rostrums (i.e. snouts) and both jaws. Like the pectoral fins, humpback whale tails (i.e. flukes) are also serrated/bumpy but here the bumps are on the trailing edge rather than the leading edge. The pattern of serration/bumpiness on the trailing endge of the fluke, along with the white/black color pattern on the underside (ventral surface) of the fluke, is distinct between individual humpbacks. Such ‘fluke fingerprints’ enable researchers to document sightings (and re-sightings) of individual whales between years and marine habitats. Humpback whales have ~270-400 baleen plates on each side of their mouth (this is a relatively large number relative to other baleen whales). 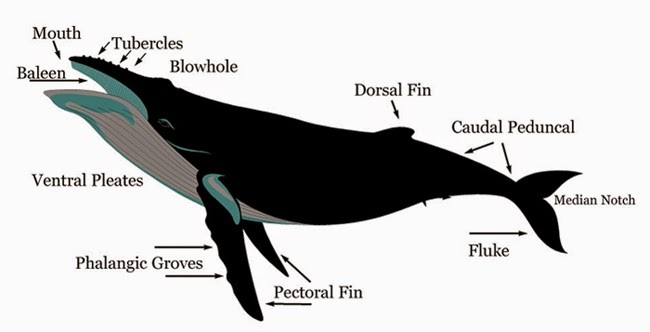 Anatomy of a humpback whale (Megaptera novaeangliae). Females are on average 1-1.5 meters longer than males. Humpback whales are cosmopolitan, which means that they can be found just about anywhere on the planet provided habitat that meets there needs of fitness and survival is available. Although humpbacks are present in all of the world oceans, they are most commonly found in coastal to shelfal waters (yet they will swim across deep ocean during seasonal migration without difficulty or hesitation). Humpback whales are perhaps best known for their remarkable movement behaviors. Of these behaviors their agility stands out – they breach, lunge, spy-hop, fluke, lob-tail, swim on their backs, pec-slap and just about anything humans would associate with body agility. Yet they are also the ultra-marathon champions of the marine mammal world (the longest documented marine mammal movement is a female humpback whale’s >9000km (!) migration from the coastal waters off Brazil to the coastal waters of Madagascar; Stevick et al., 2010 in Biology Letters). These truly remarkable movement behaviors of agility balanced with endurance make humpback whales unique. They are also the primary behaviors we will be studying in Rarotonga in 2014 through satellite tracking. Humpback whales also exhibit remarkable feeding behaviors during the spring, summer, and autumn months in biologically productive waters where small prey (e.g. krill and small fish) are available in abundance. Humpbacks are known (both as individuals and in groups) to blow curtains of bubbles into the water column – a feat that requires them to swim very tight circles facilitated by those pectoral tubercles – and gorge themselves on the concentrated prey trapped behind the curtain (i.e. bubble-netting). These good days of summer are balanced by a winter-long fast while the whales inhabit the warm, but very low productivity, waters of the tropics. The above video shows the "bubble-netting" feeding behavior practiced by some humpbacks. Not all of the narrator's comments are scientifically proven, based on my reading of the literature, but the video is nonetheless an excellent demonstration of how remarkable humpback whales really are. Humpback whale singing behavior is also worth giving a nod. Not all humpbacks sing, you see, and since it is only the males who sing the songs, the behavior is believed to be a core part of mate selection (if not mate location, as the oceans are very large places even from a humpback's perspective). Now imagine for me, if you will, listening to the same One Direction song over and over and over and over (this might not be too hard to imagine for those of you with young ones around the house, like I have). Such sonic monopolies are not all that dissimilar to humpback whale singing behavior. As it turns out, the cute littler males sing the same song – sometimes non-stop for days (Holy headache, Batman!). And just like those 1D tunes, the song has rhythm and syncopation and the semblance of a melody counter-balanced with the occasional harmony line. Now here’s the seriously neat part – it also turns out that all the males in a population sing the same song each year (please note that the songs do change from year to year, much to the female's satisfaction, I am sure). 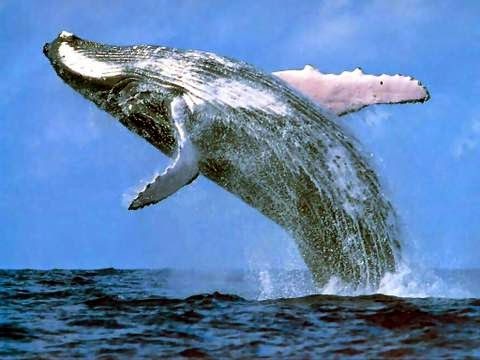 Much of what we know about Oceanic humpback whale song is the product of the great work by Michael Noad and his team at the University of Queensland (Brisbane, Australia). One of Michael's Ph.D. students, Ellen Garland was the lead author on a paper published in Science - check out Ellen talking about her work in the video below. How the song is ‘learned’, and how and why the song evolves, remain some of the most fascinating mysteries of humpback whale behavioral ecology. Learn more about Michael Noad and Ellen Garland's research on humpback whale songs! One of the humpback whale physiological behaviors that I find most interesting is the fact that most females only ovulate once a breeding season (i.e. once a winter). This fact is known from whaling data published in Australian science literature in the mid-20th century by Chittleborough (Chittleborough, 1954; Chittleborough, 1965). 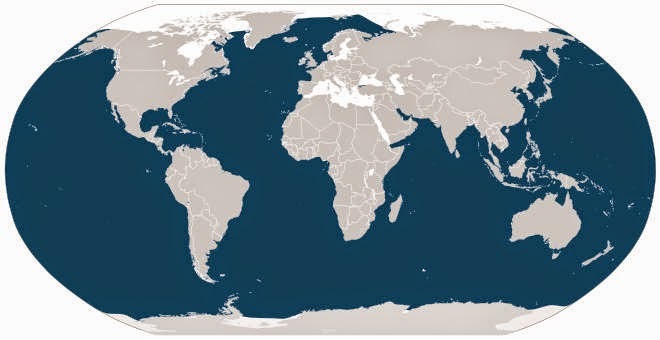 This fact piques my interest as a scientist as it demonstrates that males and females need not only to find each other in the vast expanse of the ocean but to also find each other at an appropriate time. Given the apparent spatial and temporal precision required for successful reproduction, perhaps it is not so surprising that whales congregate (i.e. concentrate) near tropical islands and off-shore reefs during the relatively short winter mating season. (One of the key questions we’re after as scientists is how they navigate, in both space and time, to these tropical habitats). Successful mating is followed by a 10-12 month gestation period (i.e. females give birth in warm tropical waters the following year; they and their babies are warm-blooded, after all). Mothers lactate for 10-12 months, and the inter-birthing period is typically 2 or 3 years. And at risk of losing my Geologist’s Club Card, I must mention that the oldest known humpback whale fossil is from ~6 million year old rocks (perhaps not surprisingly a Diatomite!) in Lompoc, California.